In a typical towing configuration, there are a handful of numbers that need to be considered, including tongue weight, hitch weight, trailer weight, and the GCWR of the tow vehicle. In order to tow a trailer safely, the weight of the trailer, everything in the trailer, the tow vehicle, and everything in the tow vehicle, can’t exceed the GCWR of the tow vehicle. In that same vein, the hitch weight of the trailer can’t exceed the maximum tongue weight rating of the hitch or the tow vehicle. If these general rules of thumb are observed, then your towing setup will typically be pretty safe. However, there are some situations where a weight-distribution hitch is required. As the name implies, a weight-distribution hitch effectively distribute some of the weight of the trailer to the front axle of the tow vehicle and the axle of the trailer itself, which can reduce the effective tongue weight that’s exerted on the hitch. Also known as load-leveling hitches, they are typically designed to be installed into a square trailer hitch receiver, and they’re actually required by many OEMs if you want to tow anything heavier than 5,000 lbs. or with a hitch weight of over 500 lbs. And while your typical pop up camper won’t ever tip the scales quite that far, there are some situations where you might want a weight distribution hitch. A weight distribution hitch consists of a few component parts. While the main function of a weight-distribution hitch is to shift some of the weight of a trailer off the rear axle of the tow vehicle, the main point is to provide the driver with a higher level of control. As the weight of a towed load increases, it will tend to “sway” and “hop” more. This becomes a huge issue when towing very heavy loads at freeway speeds, but smaller tow vehicles can be effected by relatively smaller amounts of sway and hop than large tow vehicles. When the trailer “hops,” it can effectively jerk the tow vehicle unexpectedly, which may cause the driver to lose control. When it “sways” from side to side, the driver experiences a phenomenon known as fishtailing, which can also result in a sudden loss of control. Most weight-distributing hitches work by incorporating spring-tensioned bars into the hitch setup. When installed correctly, these spring bars effectively distribute some of the downward-acting force of the trailer’s tongue weight so that weight is more evenly carried by the front axles of the tow vehicle and the axle (or axles) of the trailer itself. If you’ve ever looked at a tow vehicle/trailer system and see any “sag” (where the back of the tow vehicle and the front of the trailer are closer to the ground than the front of the tow vehicle and back of the trailer), you’ve sees the sort of problem that load-leveling hitches are meant to address. Does a Pop Up Camper Need a Weight-Distribution Hitch? In a lot of cases, you can get away without using a load-leveling hitch to tow a pop up camper. However, you may be better off with one depending on how heavy your pop up camper is and what type of tow vehicle and hitch you have. A weight-distribution hitch can allow you to safely tow the maximum weight that your hitch is rated for, while you may be limited to less weight without one. How much does your camper weigh? How much does your tow vehicle weigh? What hitch class do you have? Does your hitch support weight distribution? If your pop up camper weighs 50 percent or more of the GVWR of your tow vehicle, then you will be safer with a weight-distributing hitch. This isn’t likely to come up with especially lightweight pop up campers, but it can become an issue if you’re towing a hybrid or hard sided pop up camper with a lighter tow vehicle. In that case, even a relatively lightweight load-leveling hitch, like Camco’s 800 lb. capacity weight-distributing hitch kit will typically do the job. Of course, the hitch itself is also important to consider. If your trailer weight is right up at the upper limit of your hitch class rating, then you should consider using a weight-distribution hitch. However, some hitches can’t be used with weight distributing systems at all. If your hitch doesn’t have a weight-distributing capacity listed on it, then you may need a new hitch. There are also a few easy ways to tell if you need a weight-distribution hitch just by looking at your camper and driving your tow vehicle. 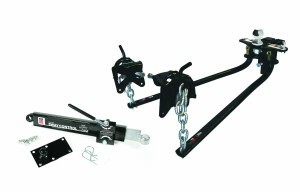 If you feel like you have trouble stopping or steering, or you can feel the trailer fishtailing behind you, then you need to look into a load-leveling hitch. Stopping problems may require trailer brakes, but sway and steering control issues can typically be cleared up with the right load-leveling system. Of course, you can also tell that you need a weight-distribution hitch if you look at your trailer and tow vehicle and see any sag. This can manifest visibly as a “sagging” bumper, a hitch that is visibly closer to the ground than the rest of the trailer and tow vehicle system, or even headlights that point upward. This video is a good illustration of the sort of sag you can get if your trailer is too heavy or the tongue weight is too high. If your pop up camper and tow vehicle look anything like this, then a weight distribution hitch may fix the problem. Of course, it’s equally important to make absolutely certain that your tow vehicle is capable if towing your trailer in the first place.